CDC comes out with new autism numbers. 1 in 68. Des Moines friends: Special Egg Hunt for our special kids! Great information on speech/language development! Eat at Joe’s Crab Shack today or tomorrow and help raise funds for Autism! Amazing story of a rescue dog helping a boy with autism! Xena the Warrior Puppy, rescued from abuse, helps 8 year old boy with Autism. The United States of Autism movie showing in Des Moines, Iowa. Fellow Des Moines friends, we will get to see a showing of The United States of Autism at the Wynnsong Theater in Johnston on May 16th!! Thanks to ChildServe for hosting this great event! I can’t wait to see it! Hope to see you there!! My friend, Keelia Paulsen, Des Moines native and owner of Khenri Shoes designs and customizes shoes. 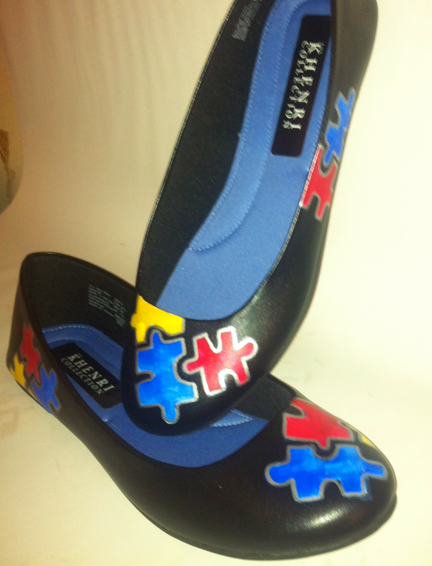 For April’s Autism Awareness Month- she created a line of super cute shoes! 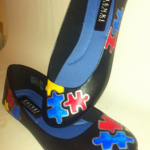 Shoes are a fun way to show your support for autism! Check them out on her Facebook page. Looks like it will be a great event for a great cause! Thanks, Americana!! I am ASHA certified and hold a state of Iowa license. 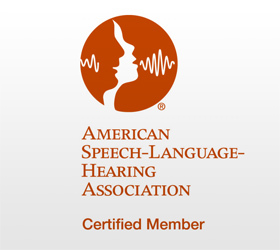 I have nearly 20 years of experience in the field of speech/language therapy. I specialize in helping children/teens with speech/language delays and Autism Spectrum Disorders in the Des Moines, Iowa.